Srinagar, Aug 12 (KNS): Governor N.N. 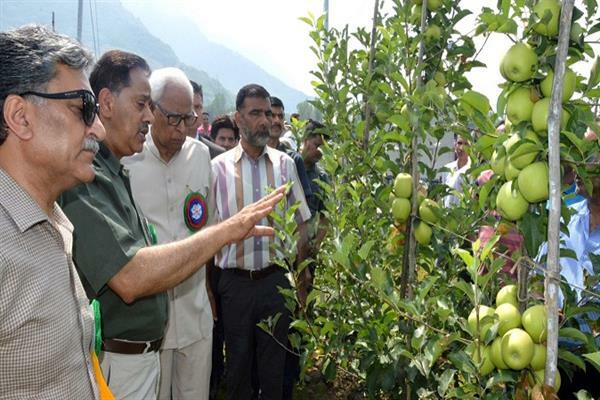 Vohra inaugurated the First Harvest of the High Density Plantation of Apples at the Sher-e-Kashmir University of Agricultural Sciences and Technology-K today by plucking some fruit from among the several varieties of High Density apples in the SKUAST-K Orchard. Governor lauded the initiatives of Prof. Nazeer Ahmed, Vice Chancellor, and his colleagues in Horticulture Faculty, for successfully raising a very attractive High Density Apple orchard in the University Campus. Governor recalled his long association with the University’s experiment to grow new varieties of fruit plants and had occasion to visit this Orchard several times since the root stock was put in the ground nearly a year and half year back. He expressed happiness on being invited at the time of harvesting of the first crop of several very attractive varieties of foreign apples. Governor observed that adoption of high density species would raise the crop production by nearly 5 times in 4-5 years and perhaps higher yield in the years to come. Governor observed that rising production will trigger many challenges: sampling and grading of fruit; proper packaging; storage in controlled climate premises; proper transportation and decision regarding timing of marketing the fruit. In this context he urged Khurshid Ahmad Ganai, Advisor to Governor, to set up a multi disciplinary team to undertake the required advance planning and timely implementation of various actions so that the growers could gain handsome profits from their investments. He also advised timely establishment of fruit processing units in collaboration with the growers. Governor suggested to Ganai to also assist the growers in installing drip irrigation facilities in their orchards and, besides, helping them in obtaining the required technical guidance to successfully grow the new species of apples. Governor advised Prof. Nazeer Ahmed, Vice Chancellor, to make a documentary on all aspects of High Density Apple cultivation and have it screened in the apple growing areas, to educate the growers. Governor witnessed the VC signing an MoU with the Jammu and Kashmir Fruit And Vegetable Processing and Integrated Cold Chain Association under which the University will provide technical knowhow to the cold storage owners for the proper storage of apples. Khurshid Ganai urged the farmers to adopt new techniques for raising production of horticultural crops and maximising their profits. While assuring the fruit growers of the Government’s full support, Ganai said that they will be taken on board before the proposed State Horticulture Policy is finalised. Prof. Nazeer Ahmed, Vice Chancellor, appealed to the farmers to come forward and take help of the University’s scientists and experts for introduction of new High Density Apple plants in their orchards. Manzoor Ahmad Lone, Secretary Horticulture gave a detailed presentation about the initiatives taken by the Department and those soon to be announced for benefiting farmers and uplifting the horticulture sector.